Manufacturers Index - Frick Co. The Foundation for Waynesboro's Industrial activity was laid by George Frick, who operated at a number of locations in the Waynesboro area. His invention of a steam engine, small enough for farm use, replaced cumbersome horse-powers. He went into business in 1848 in Ringold, Md., just a few miles from Waynesboro, manufacturing—on a modest scale—horse powers and grain cleaners. In 1850 he built a small steam engine for his own use. In 1853 he established Frick Co. to build horse powers plus steam engines of his own design and grain separators under Peter Geiser's patents. Growing quickly, Frick changed premises twice, ending up in nearby Waynesboro by the late 1850s. The Civil War caused considerable disruption as Waynesboro was occupied by the Confederate Army. After the war was ended, business resumed even better than before and new all-brick factories were built, with Geiser taking over the old Frick premises. Frick sold their thresher business to Geiser while Frick focused on steam engines. In 1870, with the business in need of capital to fund further expansion, George's cousin Christian Frick Bowman became a partner and the business name changed to Frick & Bowman. Bowman died in 1871, of typhoid fever, as did Frick's eldest son, Frank. Within a year or two the company name was changed to Frick & Co. The financial panic of 1873 was a trying time for the business, which was also facing high shipping costs because Waynesboro was nine miles away from rail access. To avoid losing the town's largest employer, thirteen local men formed a partnership to provide additional capital to Frick & Co., which allowed them to survive the financial crisis and extend the railroad into town. In about 1875 the company introduced a new line of portable circular sawmills, replacing the older reciprocating designs. Frick sawmills continued to sell very well for the next several decades. In 1879 Geiser acquired the steam-engine manufacturing business of brothers Frank F. and Abraham B. Landis and began making and selling Landis's "Peerless" steam engines. Frick retaliated by re-entering the thresher business. In 1881, with their line of steam traction engines selling very well, the Frick company built new premises on Main Street in Waynesboro, where they remain to this day. In 1883 Frick began making Corliss engines, further expanding the Frick steam-engine lineup to include very large stationary engines. By the late 1880s the partnership organization was proving too ungainly and Frink & Co. was converted to a corporation, Frick Co., with $1,000,000 in stock—a very large corporation at that time. George Frick retired, with surviving sons Abraham O. and Ezra still rising through the ranks. In 1883 Abraham had designed and built an ammonia-based and Corliss-powered refrigeration machine, which led to another successful product line, one which anchored the company after the other lines became obsolete and were discontinued. Frick refrigeration equipment was used by large-scale operations such as dairies, slaughterhouses and the emerging business of packaged food manufacturing. As they entered the 20th century Frick continued to modernize and improve their various product lines. Steam-engine sales peaked in the early 1900s. Abraham O. Frick became company president in 1904, a position he held until 1924. when brother Ezra took over. Manufacture of stationary steam engines was discontinued about 1913. During World War I the company was kept busy supplying portable steam engines and refrigeration equipment. Immediately after the war the company further expanded their factory, with modernized foundry, pattern shop and machine shop. At the same time the company introduced a new line of gas tractors but that line was discontinued within a decade. And although threshers and other agricultural equipment was manufactured as late as the 1960s but the mainstay product lines were sawmills and refrigeration equipment. Ezra died at age 86 in 1942—company president to the end. Meanwhile, with the country having entered World War II, those Frick mainstay products were deemed non-essential and the Frick manufacturing facilities were re-purposed for other war production. Following the war the previous product lines were resumed, with refrigeration equipment doing especially well. Ice rinks were a rapidly growing market at that time. Frick Co. was acquired by York International in 1987. The sawmill line is long gone and their focus is refrigeration equipment. They are still one of the leading employers in the Waynesboro area. The Threshermen.org page on Frick & Co. provided much of the early history of this firm. 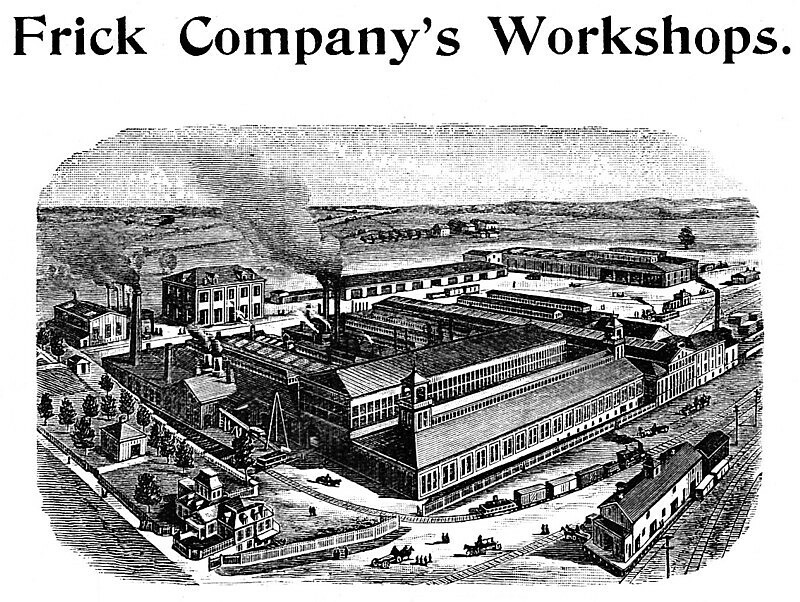 Mentioned in 1885 Manufacturer & Builder, which gives the name as "Frick & Co." Catalogs 1885-1886, 1911, ca. 1928, and 1933. The 1911 catalog gives the name as Frick Co., Inc. Listed in the 1874 work, Wiley's American iron trade manual of the leading iron industries of the United States, as "Frick & Bowman—steam engines, boilers, machine tools, etc. 50 hands employed. The U. S. Forest Products Laboratory published a booklet dated March 1936, Operating small sawmills, methods, bibliography, and sources of equipment by C. J. Telford. A table lists the makers of various types of equipment, including circular sawmills, band sawmills, edgers, and planers. This company was listed as a maker of circular sawmills, edgers, steam boilers and engines, and gasoline engines. The address was given as 320 Broadway. A page at ForestryForum.com contains the following information: "Albright Saw Company in Londonderry, Ohio purchased the Frick rights, blueprints, and tooling from Carthage." More history and machine information can be found at the Internet Archive web site.